Surely I had a better offer for a Saturday night. I had a look through recent messages on my phone. Actually, I didn’t, because I knew I didn’t have a better offer. I had no other offers, in fact. Apart from the gig! I’d been invited to a gig … now, who was it? No wait, this was weird … it was the same friend who’d invited me for a lip-drawing fumble or something. “What about the gig?” I enquired. “That would be afterwards,” he reassured me. So off I went for a five-minute speed date or something. I arrived at the bar/pub/cafe thingy in a part of town that was undergoing a gradual transformation from rundown to bohemian. Its shabbiness was part of its appeal … it had been a bank once and I wasn’t sure if the symbolism of a high street financial establishment shape-shifting into a hip bar was good or bad. Was it bad that we were retreating so far into our online worlds that high streets were becoming unnecessary? But if that meant more places such as this slightly gothic chilling point in which to socialise, wasn’t that a good thing? I actually think I was merely delaying entry into this potential humiliation but as previously mentioned, I had no better offers. So I slipped in, unobtrusively. “ARE YOU HERE FOR SPEEEED DATINGGG?? ?” the barman asked, just like that. Well, maybe it wasn’t just like that but it seemed just like that, given that I was not enthused about this foray into contrived meet-ups and I was slightly embarrassed by the whole affair. Just to clarify, I had neither desire nor expectation to make any kind of romantic connection whatsoever. My general feeling towards romance is currently one of indifference. Well, that couldn’t have gone worse. He just wanted to know whether to give me a free drink or not and instead I treated him to a revelation of my insecurities. Friend appeared and off we went to register so we could be rewarded for being desperate, single people, with a free drink. “Oh – there’s only one space left!” exclaimed an organiser of the speed fumble who was worryingly dressed as a nurse. “It’s fine,” I began, intending to finish with I’ll sit out. This made no sense to me but Friend gallantly said I could have the free drink in return for buying him a drink. And so I was registered. Friend had his drink, as did I and I awaited my change. I left the bar and realised I’d lost Friend. So I found a seat and waited. And waited. I could feel my general discomfort with the whole debacle gradually changing into distress at my apparent abandonment by Friend. “Aren’t you doing the speed dating?” enquired the pretend nurse. I wanted to leave at this juncture, but all eyes were on me as I walked across the bar/pub/cafe thingy and all eyes of fellow five minute fumblers-to-be were on me as I joined their party in the smallest, scruffiest corner of a bar/pub/cafe thingy I have ever seen. “Why did you leave me?” all other feelings got mashed together to produce one feeling of upset towards Friend. “I thought you’d gone,” he replied to me, but looking round at the eyes which were all on him now. Never mind speedy fumbles and five-minute lip-drawing, the attendees were being treated to a real life couple argument. Only we weren’t a couple, but we did sound like one to be fair. Whilst all eyes were on us, I had a quick scan of the male of the species (the species being ‘single people with no better offers on a Saturday night’) and not one really cut the mustard, frankly. Well, one was reasonably attractive but I felt that any likelihood of connectivity that night had seriously plummeted after my mini tantrum. And so lip-drawing speed dating commenced. There were 18 of us, which I felt was a poor show, but remembered that we had been ‘squeezed in’, so this was clearly a good show for the organisers. 9 remained seated and 9 moved around the room. Well, corner of the bar/pub/cafe thingy. I was a ‘mover’ and Friend was a ‘sitter’. I moved to my first sitter and it turned out to be Reasonably Attractive. Politely, we introduced ourselves to each other and I began to draw his lips. “I didn’t know this was speed-dating,” he said, through pursed lips, so I could continue to draw them. It occurred to me at this point that drawing noses, or eyes, or anything other than lips, might have been better, as one needs to continually move one’s lips in order to communicate. “Really?” I queried, wondering how you could possibly mistake Lip Drawing Speed Dating for anything other than speed dating. “Yes – I thought it was an art class,” he expanded upon his excuse for being there. “And I should mention that I’ve got a partner,” he continued. I laughed in reply, as if it didn’t matter. To be honest, it didn’t. I picked him out as the one I’d pick if I had a gun to my head, but I didn’t actually care. 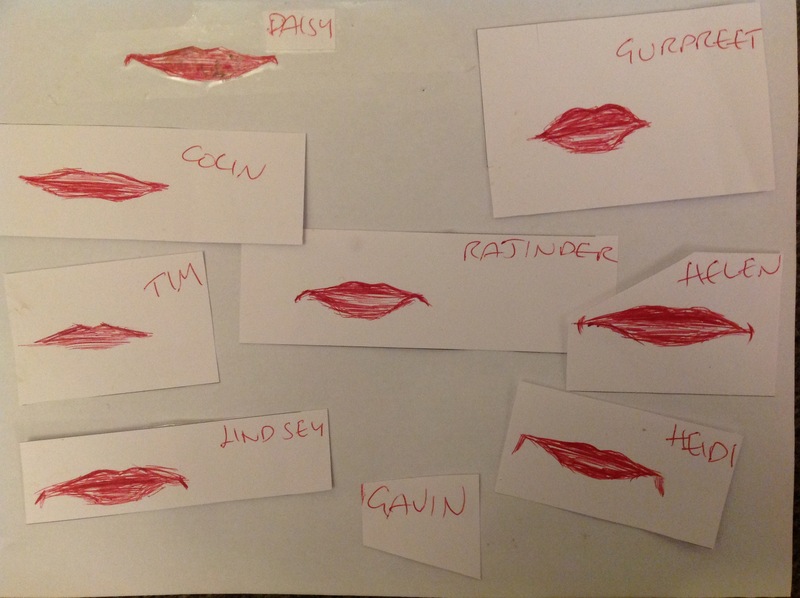 Reasonably Attractive finished my lips and I moved onto ‘Tim’ … then ‘Rajinder’ … and at some point the people with a particular symbol displayed on the compulsory stickers (AKA men) ran out and I had to move onto those with phallic symbols on their stickers (AKA women) instead. Which was fine, seeing as I wasn’t really looking anyway, but it confirmed my suspicions that this wasn’t really speed-dating. As it turned out, it was an artist’s attempts to get random people’s lip portraits. I couldn’t tell you why, apart from the fact that this is Brighton; fellow Brightonians will understand. Lastly, I had to draw Friend’s lips. We were being civil towards each other by now, so I relaxed a bit and anticipated 5 minutes of not having to make small talk but instead he got up and left. “Now seems like a good time to go to the loo,” he said as he walked off. “Oh ok – I’ll just draw your lips from memory …” I tailed off as I realised he’d gone and couldn’t hear me. Once again, all eyes were on me. I smiled at their pitying glances, as I was left, alone with my random lip drawings and a cup of water. I tried to draw his lips from memory but I realised I had no clue what his lips were like. In my defence, he has a beard, so I tried drawing a beard instead but failed. This was someone I met for coffee most Saturday mornings and therefore whose face I had looked at a lot. I thought about other friends’ lips and it dawned on me that I am not familiar with my friends’ lips. I can recall family members’ lips but not many others … this is something to address. And thus ended Lip-Drawing Speed-Dating. There were prizes for the best lip creations and I wanted to stay, just in case. But Friend wasn’t keen, as the gig in a nearby pub was starting. Pretend Nurse assured us that the prizes were not worth waiting for. “But still …” I protested, thinking that even if I got a box of chocs or a bottle of plonk out of this bizarre experience, it would be worth the wait. “Where’s that gig?” I said to Friend and off we went for Part II of the very Brighton evening.